Le profil correspond à un CDD de 36 mois, au sein de l'unité BIOGER de l'INRA, située à 30 km à l'ouest de Paris. INRA is a French public research institution that focuses on issues related to agriculture, food and food security, environment and land management, with a particular emphasis on sustainable development. The Unit BIOGER gathers teams working on major fungal crop pathogens using pluri-disciplinary strategies from functional genomics, evolution and population genetics to microbiology, epidemiology and modelling. The post-doctoral research associate will join the teams “Epidemiology of Wheat Fungal Pathogens” and “Antifungals, Mode of Action, Resistance” at INRA BIOGER. He/she will conduct researches within a collaborative project between INRA and a private company aiming at the identification of genetic determinants involved in the pathogenicity and fungicide resistance of Zymoseptoria tritici, responsible for septoria leaf blotch disease on wheat. The approach followed will consist at acquiring whole genome resequencing data to identify polymorphisms, and precise quantitative phenotypes to perform genome wide association genetic studies (GWAS). 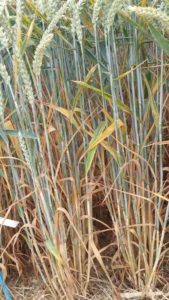 The results obtained will greatly help implementing responsible and relevant disease control measures and more generally, improving the sustainability of fungicide modes of action and the management of resistant wheat cultivars in a context of reduced usage of plant protection products. REX Consortium (2016). Combining selective pressures to enhance the durability of disease resistance genes. Frontiers in Plant Science 7(1916). Sanchez-Vallet A, Hartmann FE, Marcel TC, Croll D (2018). Nature’s genetic screens: using genome-wide association studies for effector discovery (Opinion Piece). Molecular Plant Pathology 19(1): 3-6. The position is available from January 2019 and will remain open until filled with review of applications and interviews. Depending on work experience, a gross salary comprised between 2500€ and 3200€ will be offered, including full social and health benefits.